Improve Access. Maximize public transportation and pedestrian access to the site. This means providing comfortable bus stops and shelters located close to building entrances, with direct access. Fencing and landscaping should not create barriers, and access should be safe for the elderly, disabled, and small children. Direct and safe pedestrian access between stores and adjacent buildings is essential, and may require coordination between different land owners. Increase Density. 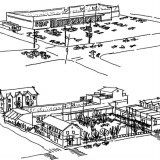 Increase the shopping center's density with added levels of retail, new buildings in existing parking lots, and offices or multi-family housing around the perimeter. See illustration below. Change the mix to include educational and cultural activities. Museums, art centers, trade schools, and libraries, among others, add life and value to Centers. Retrofit Parking. The goal is to discourage single occupant vehicles, and reduce the amount of parking. 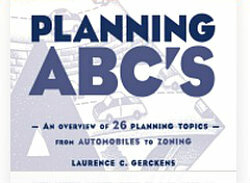 Abundant free parking encourages auto dependency; tight parking discourages it. 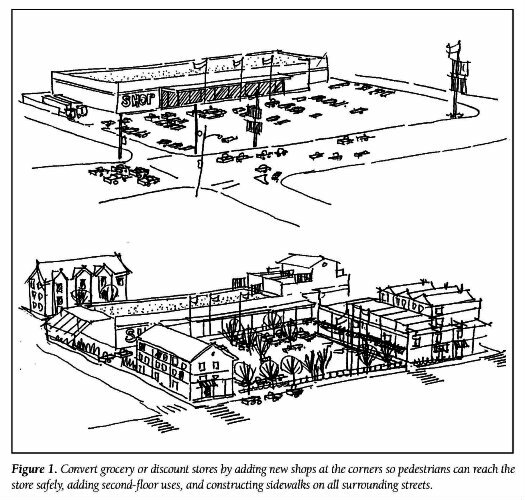 Existing lots can be retrofitted with sidewalks, landscaping, and covered walkways to be more pedestrian-friendly. New parking lots should be located on the sides and behind buildings, with retail being near the street.